It is no more current news but it is heart-warming that Nigeria got 95,000 slots for Hajj 2018. This was the same number of slots granted Nigeria for 2017 Hajj by the Saudi government. The slots were shared 75,000 and 20,000 to the State Pilgrims Welfare Boards/Commissions/Agencies and the private tour companies respectively. The slots were granted at a ministerial meeting between Saudi Arabia and Nigeria in Makkah, Saudi Arabia where the Memorandum of Understanding (MoU) for 2018 was presented, an event that kick-starts the processes of Hajj every year. This year, the Saudi Arabian delegation was led by the new Minister of Hajj and Umrah Affairs, Dr. Muhammad Saleh Bin Taher Benten while the Nigerian delegation was led by the Minister of State Foreign Affairs, Hon. Khadija Bukar Abba Ibrahim in company with the Chairman/CEO of the National Hajj Commission of Nigeria (NAHCON), Barr. Abdullahi Mukhtar Muhammad and Nigeria’s Ambassador to Saudi Arabia, Ambassador Isa Muhammad Dodo. However, Nigeria is optimistic of fully utilizing its slots for 2018 Hajj, being the fifth country in the world with the highest number of pilgrims to Makkah. Besides,it was not fully utilized last year due to the global/national economic recession and presumed hike in the Hajj fares. 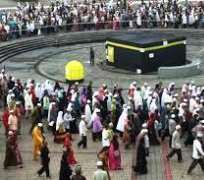 Yet, it was surprising that Nigeria was one of the countries with large number of Hajj slots who utilized over 90 percent of its quota for last Hajj. Over 81,000 Nigerian pilgrims officially participated in the 2017 Hajj, kudos to the National Hajj Commission of Nigeria which explored all humanly possible means to ease the effects of the fares and opened up amicable communication with the Saudi authorities to relax huge penalties on Nigeria for crossing deadlines. That should not be allowed this year because of the high prestige Nigeria has garnered globally over the years in the management of Hajj affairs. It would be recalled that Nigeria’s Hajj slots were 95,000 before 2012 when the Saudi government, due to the expansion projects on the Grand Mosque of Makkah and Prophet Muhammad’s Mosque in Madinah, slashed down slots for all countries by 20 percent, thus reducing Nigeria’s quota to 75,000 shared to state boards and tour operators 65,000 and 10,000 respectively. The downward review caused agitation amongst the Nigerian Muslims who exhausted the slots every year until the 2017 Hajj that witnessed the restoration of the 20 percent global reduction. Unfortunately, the supposedly good news for Nigerian potential pilgrims was marred by the economic recession and increase in Hajj fares. A lot of them who made huge deposits awaiting the announcement of the Hajj fares by NAHCON found it very difficult to complete the fares. In some states, some pilgrims withdrew from the journey. In short, some states could not utilize half of the allocations given to them by NAHCON. But notwithstanding, a few other states exhausted their slots and demanded for more. It was a tough experience that tested the managerial prowess of NAHCON’s leadership which embarked on aggressive awareness campaign throughout the country on the dangers of losing Hajj slots while Nigeria had been making demands for more slots according to the increase in the Muslim population in Nigeria. By the time the registration deadlines were done, little below 50 percent of the total slots was utilized. The commission explored all available means: the radio, television, Mosques, zonal meetings and meeting with some governors to encourage the pilgrims to pay up for the Hajj exercise. The national ulama team which is constituted by NAHCON from amongst the high class Islamic scholars in Nigeria was mandated to reach out to Muslims in their domains. That effort eventually yielded fruitful results. That is why the Saudi government must have agreed to grant same quota to Nigeria. On this note, the national ulama team of NAHCON and all relevant teams, including the media have the onerous task of continually preaching to the Nigerian Muslim Ummah on the need to completely utilize the 95,000 Hajj slots for 2018. Since the nation’s economic situation is gradually but steadily improving, chances should not be open for the Saudis to reduce Nigeria’s quota in future due to inability to use up the given slots. For the ulama team, they should utilize some of their sermons on Fridays and preaching in Mosques and religious gatherings to reach out to the intending pilgrims. They should seek the support of the Islamic scholars within their vicinities. They can go further and explore house to house meeting with Muslim families who have the interest and intention of going to Hajj. For the NAHCON, it has already released the deadlines for every Hajj activity from the preparatory stage to the end of the Hajj exercise to state boards, in confirmation with the guidelines and dates released by the Saudi Arabia authorities. It advised intending pilgrims to make deposits of N300,000 monthly from November 2017 to March 2018 in order to make up N1.5 million, depending the final announcement of 2018 Hajj fares by NAHCON. It also advised those who can make bulk deposits of such amounts at once to do so. By the time the Hajj fares are announced, those whose deposits are more will definitely be refunded their balances and those who have deficits can easily complete the payments. This is because the Saudi Arabia authorities have vowed not to tolerate late payments for services which every country struggles to secure for its pilgrims. The host country, in its renewed commitment to overcome the challenges which pilgrims faced during the 2017 Hajj especially in Mina, cannot change its schedules for any Hajj event. Saudi Arabia strives to give all human comfort to pilgrims and Nigeria must assist them in securing the best services for the pilgrims who must in turn pay in time to guarantee such services. For the media team, the field is very important to reach the intending pilgrims. They should not only see it as a service to humanity, they can be assured that the spiritual reward of making a Muslim perform his or her obligation is immeasurable. And the overall is on the governors who are primarily the owners of their boards and by extension the pilgrims. They should release funds to their Muslim Pilgrims’ Boards or Commissions or Agencies early enough to put them on the track of meeting up with the March 2018 deadline. It is especially necessary to remind the governors of states of Southeast and South-South that all Hajj activities are time-bound. It is unpleasant to find that pilgrim boards for these two geopolitical zones, save one or two, often cause operational hiccups for Hajj every year due to very late remittance of Hajj fares as well as lack of mobilization of the board officials by their state governors. Finally, we must realize that it is not enough to rejoice that Nigeria was granted 95,000 seats for 2018 Hajj, the onus lies on all members of the Nigerian Muslim Ummah to ensure the full utilization of the slots and timely payments of the Hajj fares to guarantee securing best services, as always, for the Nigerian pilgrims.